Probability theory is the part of mathematics that studies chance. This is best illustrated by games of chance. For example, when tossing a fair coin, the probability of it turning up heads is 1/2. Throwing two dices. 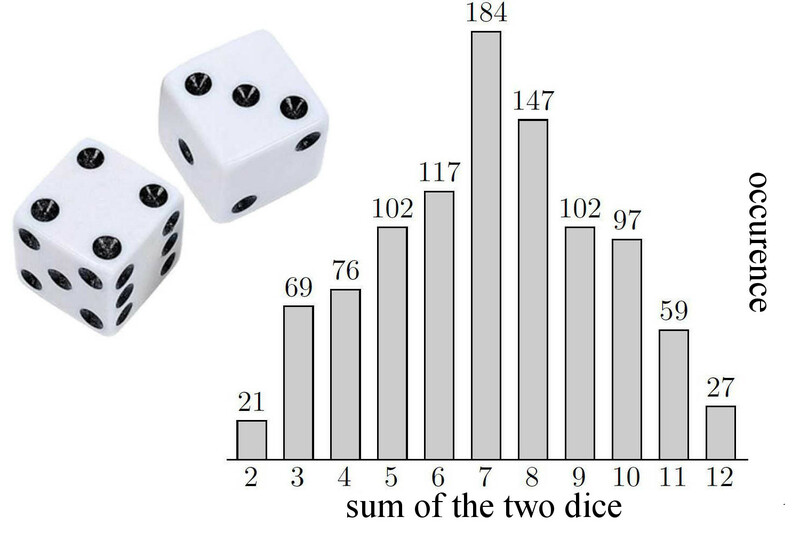 On the right, we see how often a certain sum occurred, when we threw two dices 1000 times. We rely on randomness in board games. In Settlers of Catan, we toss two dice to decide which and how many cards the players receive. The outcome 7 is the most likely and has a chance one out of six, the outcomes 2 and 36 are the least likely with a probability of . Now we understand why 6 and 8 are such desirable numbers! There are many interpretations of what a probability is, and discussions about this can become quite philosophical. We will not dwell on these philosophical aspects. The simplest interpretation of the probability of an event is in terms of repeating an experiment many times, in such a way that different experiments do not influence one another. Then, the probability of a certain event corresponds to the proportion of times that the event occurs in many of such independent experiments.